It has multiple functions: the arm goes up, down, left, right and you can even move the hook and the platform forward and backward. It would make an ideal gift that any child would be sure to love. 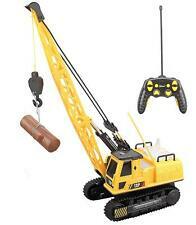 A giant crane for even bigger fun! Cheetah The King Tower Crane RC. Condition is Used. Shipped with USPS Retail Ground. Maximum lifting force: the longest boom when 3 KG, section 6 boom to recover after the maximum 3.8 KG, section 5 boom to recover after the maximum 4.8 KG, the fourth quarter after the boom to recover maximum 6 KG. 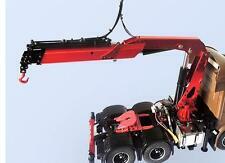 TR-114 RC Crane. Fully Functional: Forward, Backward, Left, Right, Hook Up and Down, 720° Rotation, with Lights and Sounds, for indoors or Outdoor Use. Hook Up and Down. Toy Bucket. Item No: 91115. 1 x RC Tower Crane. Function: The operated station can rotated 680 degree, the arm can be adjusted up and down / left and right. Transmitter Frequency: 2.4G. It is also suitable for personal collection or gift for friends/ children. Basic information Model:E516-003. The console can spin 660°. Boom lift and down,stretch and shrink. Battery:3xAA battery(not included) Battery: AA 4.8v 300mah. Motor:brush motor. Speed:0.72m/s Power system Esc: brush. Item No: E516-003. Forward left bend,backward left bend,forward right bend,backward left bend,opertation platform 360 degree rotation,boom lifting/stretching,hook lifting. Transmitter Frequency: 2.4G.